Spring is literally springing and here at Psylo Graphics we’re in on the early spring season outfit must-haves. We can provide and embellish any brand or style of apparel available for wholesale. Being in Southern California gives us fast and cost effective access to popular premium quality brands like Bella+Canvas, Alternative Apparel, Next Level, American Apparel, Independent Trading, AS Colour and many more! Our broad selection of blanks for this beautiful blooming time of year offers everything from cropped and slit-cut hoodies, to fashion forward fleece vests for him or her and slick bombers and shell jackets. All in a variety of vibrant hues and soft subdued classic tones too. All these styles are not just fashion forward and trendy but also great for customizing and decorating with screen printing, patches or embroidery! For information about purchasing and decorating sweatshirts go here! Bella+Canvas Women’s Cropped Fleece Hoodie: This is an early Spring outfit must that can turn into a fine fleece piece for the Fall. The dropped-shoulder cropped 52% Cotton, 48% Poly blend hoodie with a dyed-to-match drawcord is a cute little thing that can go a long way’s time. American Apparel Women’s Flex Fleece Cropped Zip Hooded Sweatshirt: Comfy as can be, this 50/50 cotton/poly cropped zip- up hoodie comes embellished with a white zipper and drawcords. It’s a classic design and a stylish option for this season and others to come. 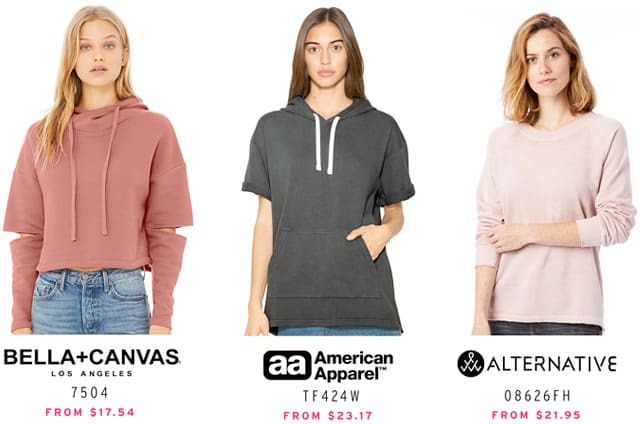 Bella+Canvas Women’s Cropped Triblend Hoodie: If you’re ready to start putting your early Spring outfits together, this is one piece you should seriously consider including, because it just might turn into your Summer night’s fashionable friend later. It’s a super-soft (50% Polyester, 25% Cotton, 25% Rayon) cropped hoodie that comes in the best colors of the season and the next. We can provide and embellish any brand or style of sweatshirts available for wholesale. For information about purchasing and decorating women crewneck sweatshirts go here! 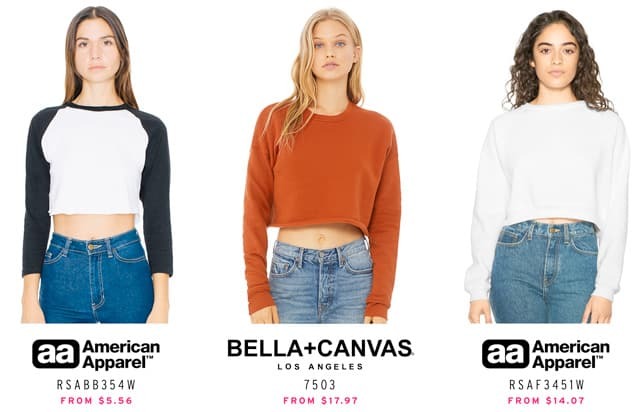 American Apparel Women’s Poly-Cotton 3/4 Sleeve Cropped T-Shirt: This 50/50 Cotton/Poly 3/4 Sleeve Raglan is a must for many. Available in 4 different soft sleeve colors. This pieces is good for any kind of activity in the earliness of Spring. Bella+Canvas Women’s Cropped Crew Fleece: A classic, cropped. This super-soft fleece pullover sweater was designed to both keep you warm and let you breath. Available in the seasons coolest colors and finished with ribbed cuffs, consider this for your early spring outfits bucket list. American Apparel Flex Fleece Crop Pullover: Simple and swell for the Spring. The 50/50 raglan sleeve cut cropped fleece is a nice option for the classic creatures of California. Independent Lightweight Windbreaker Jacket: This Lightweight Windbreaker works great as an early spring outfit! Soft to the touch, versatile, and great for layering, this lightweight windbreaker packs easily and is great for all weather conditions because of it’s water resistant 82gm 100% polyester body fabric with a zip front closure, scuba neck, mesh lined 3 panel hood, and welt pockets. AS Color Men’s Union Jacket: This is a timeless classic, a collared Shell Jacket. Comes with a silver YKK zipper, two pockets and adjustable cuffs and hem. Made with 100% pre-shrunk cotton, this heavyweight jacket might keep you cool you all year long. Independent Lightweight Bomber Jacket: Use Bombers, not Bombs! This is a lightweight 100% poly fabric jacket with a front zip closure. It’s soft to the touch and cool-looking to the eye. Packs easily and is great for all weather conditions because of it’s 82gm water resistance. We can provide and embellish any brand or style of jackets available for wholesale. For information about purchasing and decorating light jackets go here! AS Color Unisex Brush Crew: A classic crew never hurt anybody! This simple sweatshirt with raglan sleeves comes in a dark pallet for nice early spring nights and afternoons. Independent Unisex Midweight Pigment Dyed Crew Neck: Standard fits for Spring! Another basic shape that can still add style points to any outfit. This cool cotton crew comes in many colors with a washed out look and feel. AS Colour Men’s Premium Crew: Another Spring, another timeless classic. This 100% cotton crew neck cut and slim fit sweatshirt comes in plenty colored options for the boys that like to look fresh for the flowers. We can provide and embellish any brand or style of crew neck sweatshirts available for wholesale. For information about purchasing and decorating crew neck sweatshirts go here! Bella+Canvas Women’s Cut Out Fleece Hoodie: Spring comes around once a year. A trend comes, goes and sometimes never comes back. But a super-soft sponge fleece sweater with cut out elbows, a cross-over hood and dyed-to-match drawcords is an edgy, must-have, early spring outfit item, it comes and you get it! American Apparel French Terry S/S Hoodie: This fun french terry short-sleeve hoodie is the perfect garment for nice cool day in the Spring, a fine cool night in the Summer and a warm afternoon in the Fall. Its convenient kangaroo pocket makes it even helpful to have and the natural colored flat-cord is the whip-creme on top. Alternative Lazy Day Burnout French Terry Pullover Sweatshirt: This authentically worn-in pullover is the comfiest of the comfiest. 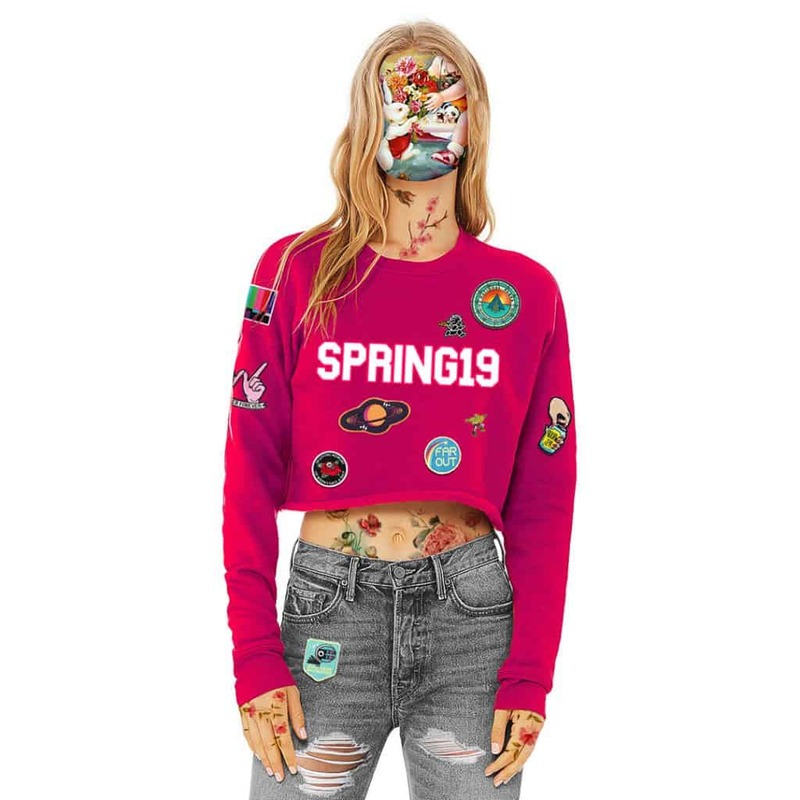 A sweatshirt for the laziest and/or craziest early days of the Spring. Alternative Champ Color-Block Eco-Fleece Sweatshirt: This champ right here is made of Eco-Fleece, organic and recycled materials from the U.S.A. Its color block combinations to choose from make it friendly and fun! A sweater for the season, for both women and men. 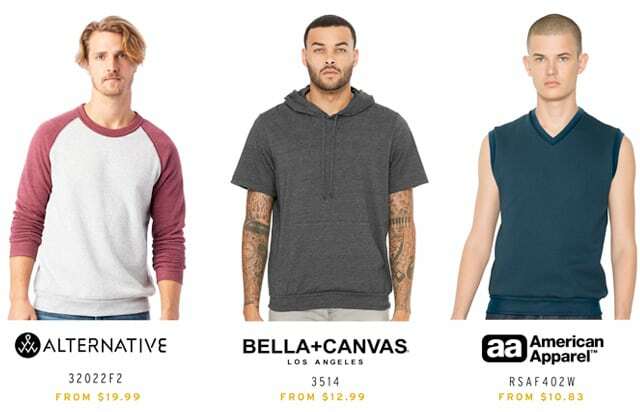 Bella+Canvas Men’s Jersey Short Sleeve Hoodie: This light-weight jersey hoodie with short sleeves and a boxy fit is a great way to set your designs apart. It features drawstrings for an adjustable fit and a kangaroo pocket for convenience. American Apparel Flex Fleece Vest: This cool flex fleece vest might make this early spring outfit better than the rest. Independent Unisex Midweight Pigment Dyed Hooded Pullover: This pigment dyed pullover hoodie comes with unique vintage character. Both comfy and eye-catching, these cool sweatshirts come in a variety of amazing colors, all accomplished during the full garment dying process, and made up of a blend of 80% ultra soft cotton and 20% poly fleece. 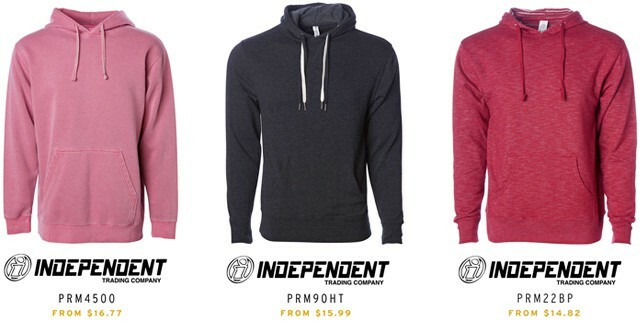 Independent Unisex Heather French Terry Hooded Pullover: This unisex mid-weight heathered pullover hoodie fits the body like a glove and has a nice interior made of french terry fleece. Available in a variety of beautiful colors, it’s the perfect sweatshirt for all occasions. Independent Baja Stripe French Terry Hooded Pullover Sweatshirt: This mid-weight men’s pullover hoodie is a great early spring outfit option. Inspired by south of our border, Baja. This quality constructed hoodie is made with Premium french terry fabric using a unique knitting process of combined yarns. It’s as special of a style as Baja is a special place. For information about purchasing and decorating hooded sweatshirts go here! 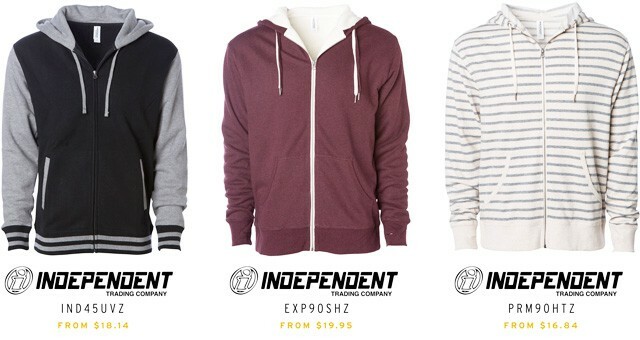 Independent Adult Unisex Varsity Zip Hood: Soft varsity zip hoodie gets an A+ in softness and style. It’s unisex, it’s universal and comes in 6 classic color combos! Made of Premium ring-spin cotton, a fleece lined hood and gunmetal eyelets. Independent Unisex Heavyweight Sherpa Lined Heather Zip Hood: This cool poly blend fleece zip hoodie with a sherpa lined interior is a great piece to add you your wardrobe the early Spring season. It comes with 2 drawcords and an antique nickel exposed zipper in a few classic colors to choose from. Independent Unisex Heather French Terry Zip Hooded Sweatshirt: This yarn dyed fleece made zip hoodie has a contrasting french terry interior and 2 flat drawcords. It comes in many bright and not-so-bright colors, and stripes too. It’s a good piece to have for the early Spring season. We can provide and embellish any brand or style of zip hoodies available for wholesale.